Made originally, I’m sure, out of frugal necessity to find a use for a few left over materials, this souffle is every bit as good as a fancier version, doesn’t require any special equipment, although an electric mixer is nice to have, and isn’t in any big danger of falling – a casserole or gratin dish works very well. A little left over white sauce & a bit of broccoli – a souffle do make! This is one of my favorite ways to use a left over white sauce or Mornay (or a favorite reason to make some or make a little extra when making white sauce for another dish) and I’ll serve a souffle like this as a part of a light brunch or a side dish for dinner. So take a look at your left overs in a new light – with kind eyes! A dab of this, a bit of that doesn’t need to go to waste and can become a master piece in it’s own right. Perhaps better than the original dish! And what ever you do, don’t toss any left over white sauce or Mornay – it only took a bit to make this souffle and half the work was done. 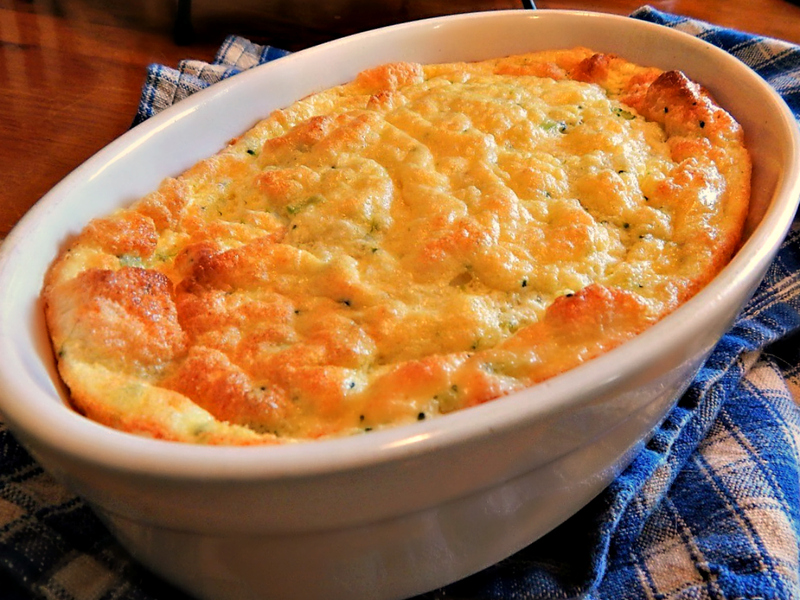 Simple Country Souffle – this one was Spinach or Broccoli? Use finely shredded food, meat, fish and/or vegetable. Prepare a well seasoned thick white sauce. Use 1/2 cup of food for 3/4 cup of sauce. Separate three eggs, beat the yolks well and add to above. Beat the whites till stiff and fold in. Pour into well oiled baking dish and bake at 375 degrees until knife comes out clean – this depends on your pan – check at about 20 – 25 minutes. Remember your seasoning is going to flavor the egg whites you’ll be folding in so make sure not to be too skimpy. Cheese may be added, finely grated. A pinch of nutmeg, cayenne or a favorite spice or herb might be very welcome, here. The recipe for white sauce is on my post, White Sauces and what to do with them. This entry was posted in Click here for Bargain Meals, Click here for Fabulous Food Posts and tagged Bargain Meal of the Week, Breakfast or Brunch Dish, Frugal Hausfrau, leftover fish, leftover ham, leftover vegetables, leftover white sauce, Leftovers, Souffle, White sauce. Bookmark the permalink. I meant yolks and ‘whites’. I’ve made salmon, spinach, and, of course, the regular souffle with just cheese. Nice and fluffy. Here’s a link to the salmon souffle I made. This looks delicious and I also love that it was from your Grandmothers cookbook. I’ve never cooked a souffle – I’m definitely going to try this! Thanks! I love that, too, and always wonder if Grandma made this! Sometimes I can tell, a smudge here, a little something spilled there, or a carefully written note gives it away! I look for those things too. Love it! Oooh, that sounds marvelous, and I love the idea of serving this out of a cast iron skillet – right to the table, elegant rustic! 🙂 or rustic elegance! I’ve never made one before, but this looks yummy and very easy. My pleasure, Kathryn! Just fyi – 4 degrees here when Gibs and I went for our walk today. I had to wear my “Mad Bomber” hat! I’m a little jealous of your locale! The title pulled me in . Souffle from ‘anything’!!! Wow!! Can’t believe it is that simple. I’m so glad, and thanks for the comment. 🙂 And it is! Especially if you make something with white sauce and have a little extra. Very doable. Not fussy at all. Wonderful, I love how simple this is yet I am certain it’s every bit as delicious as the fancy souffle’s. Great way to use leftovers and I am loving your Grandmothers 1917 cookbook. Thanks! I have talked a lot about my Mom’s Meta Given’s Enclopedia of Modern Cooking, but I don’t think I’ve mentioned Grandma’s book much! I should take a couple of photos from it.